Hello again guys! Just a little disclaimer, none of these images are mine and I'm not pretending that they are in any way, shape or form! 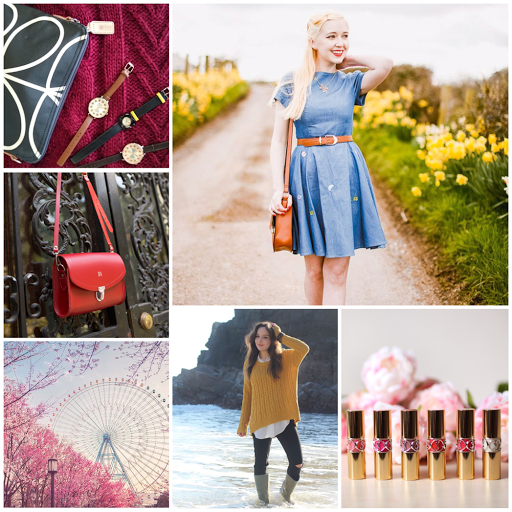 All of the images below were found through the power of Google image search, I used a variety of keywords and chose a variety of images that I really liked; for example Cambridge Satchel Company, Orla Kiely watch, Cath Kidston dress etc. This is how I found all of these images and if you do the same you'll find so many similar images available. The collages were made by me, to reflect the kinds of style and subjects that I'm loving at the moment. Many of these images are also viewable on other platforms such as instagram or Pinterest, I'm not using any of them for anything other than this appreciation post. 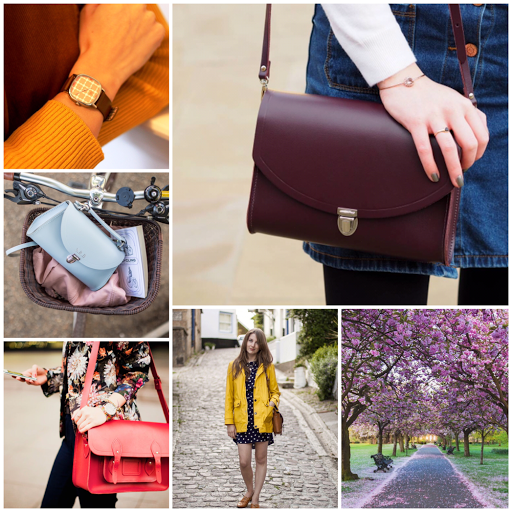 As soon as the season of Spring arrives, I like shopping around for pretty handbags and this year I've become obsessed with the across body sized Cambridge Satchels as they look so versatile, classic and lovely with any outfit, in any colour. One of the reasons why I love reading other blogs is gaining inspiration for my own looks and blog posts, I've definitely found the love of these bags from the blogging community, one of my favourite satchel looks comes from sophieetc and I adore every single one of the looks created by Rebecca on her blog aclotheshorse who I've featured at least twice in the range of collages below. One of my favourite ever brands is Cath Kidston and I've found so many beautiful vintage style designs on the blog featured on their website which suit all kinds of body shapes with their 1950s style flare cut. I definitely dress much more feminine in the warmer months, wearing dresses and accessorising much more than in the winter months. I'm looking forward to trying to make an effort and recording my outfit choices and posting them onto my blog as I enjoy seeing what others have worn on their blogs. Im really loving the look of the thin denim dresses, I may have to order one!